My Christmas present this year was the promise of a dog. Namely from Christmas on I had the option to travel with a dog if I wanted, or I could wait until we were back in Germany. I think Patrick finally broke from seeing how excited I got whenever we were charged by a happy dog or puppy. I was hesitant to get one however. Not because of the trip, most dogs cruise around on motorcycles here in SEAsia, and we have seen many others in Europe. Plus any dog of ours was going to have to get use to motorcycle trips. So this was not my initial block. What made me hesitant was the flight. A long and terrifying flight. (Or a drugged one). So how did we go from “wait until Germany” to “meet Mango the motorycle puppy?”Read on! 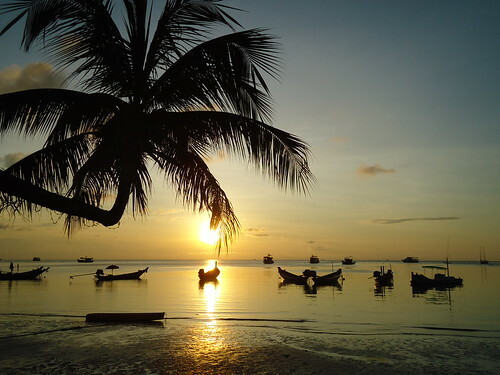 At the moment we are on Koh Tao. Patrick’s dad, his cousin Joscha, and our friend Ed will be visiting us for a couple of weeks in Chiang Mai. (The same guys we met up with on our trip to Turkey and back, they were the smart guys who motorcycled Turkey in the spring rather than the dead of summer). We were in Chaing Mai for the Horizon’s overland motorcycle traveler meeting (next post I promise). The meeting was the 13th and 14th. they arrive on the 30th. We debated sticking around, but since the plan is to ride North Thailand with them, we decided to have a beach vacation instead. A week and a half on Koh Tao with the boys (Patrick and his brother, we were reunited in CM) doing their Rescue Diver as well as ship wreck diving, and me writing. (Working on the Turkey book and a creative translation of Fernweh). 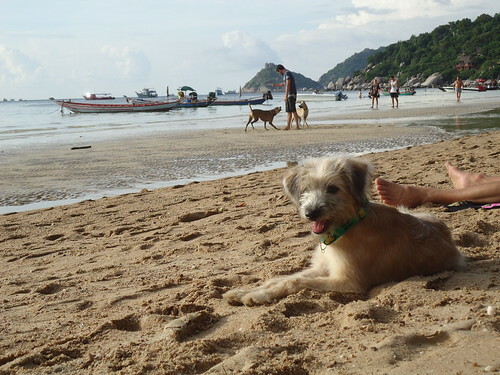 We headed down to Koh Tao pet clinic to see if I could volunteer a couple of days and take the dogs for walks or feed them. Once we got there Dr. J explained that the clinic is not really what one expects from an animal shelter in Germany or Canada. The dogs mostly live across the street in the park but the door is always open for them to come in and seek shelter. They educate the neighborhood on dogs, encouraging them to get to know the dogs, trying to get the local restaurants to feed them leftovers rather than rat poison. (Sadly this is not always the case and the night Mango became ours Dr. J could not come in person as planned because two dogs were brought in due to rat poisoning). Patrick passed on how much I wanted a dog and that I wanted to get one from a shelter because we want a dog that needs a home and will probably not find one. Everyone wants puppies but what about the adult version that gets kicked out once the family realizes puppies get bigger and are as much work as they are cute. A puppy and a dog in need from a shelter? It sounded perfect. And then I saw him. And he is beyond perfect. But what about the terrifying plane ride? Less than ideal yes, however when you factor in life on a street where no one wants you, even on a tropical island, all the good years of otherwise only traveling by motorcycle will outweigh his scary ride. In Germany he will have a wonderful loving home where his only worry is how spoiled he is. Not how will he find enough to eat, survive rat poisoning, and the general abuse heaped on an unwanted street dog. The way he still slinks up to new people, desperate for their attention before darting away before they can touch him, is not only heartbreaking but suggests that even in 4 short months someone has kicked, hit or otherwise hurt him. But other than walking into a glass door (he did look embarrassed about it afterwards), being terrified of waves and other dogs, he is already acting like a normal puppy. It took less than a day to have him walking on his leash, and except for loving Patrick more, adores us both. A huge jump forward from his first day with us which was spent curled up refusing to move. And anyone looking for a new pet I really recommend going to a shelter first. Yes some are psychologically troubled pets and therefore not suited for a family with children. But they would love to become the family of a person without children. Others are wonderful family dogs abandoned because of work or moving who need you desperately. 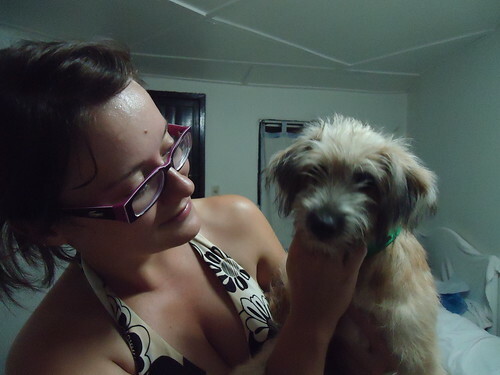 I am planning to relocate to Koh Tao for a few months with my small dog (also a rescue), did you find it hard to cross by boat with the dog? So far I’ve checked with the airlines, Thai entry and accomodation and all accept dogs, but I couldn’t find information for the ferry. Your assistance would be much appreciated! Hi Irene, it was super easy to go on the boat with Mango, no one said a word and I did not pay for him. So no worries there. Buses (long distance ones) will not take dogs. They are allowed on trains but only second class fan, and cost 100 Baht. Otherwise you are good! Travel with dogs is relatively easy and a lot of places allow you to stay with your dog. 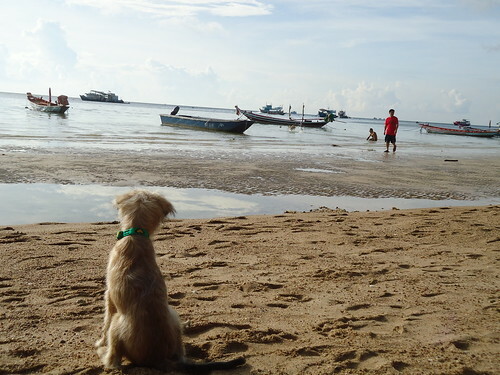 But pelase be careful on Koh Tao, some beaches are more dog friendly than others, and the upscale beaches do put rat posion out for the dogs. 🙁 Not enough of a worry not to go, but enough of one that you want to keep an eye on him/her!